The first MSSL event at Summerhill Villa went great! Manak was a big help – he introduced me and I introduced the em-cee Luke Kim. Students and teachers performed including myself and Manak who played a lovely song on his guitar. The Seniors really enjoyed it! 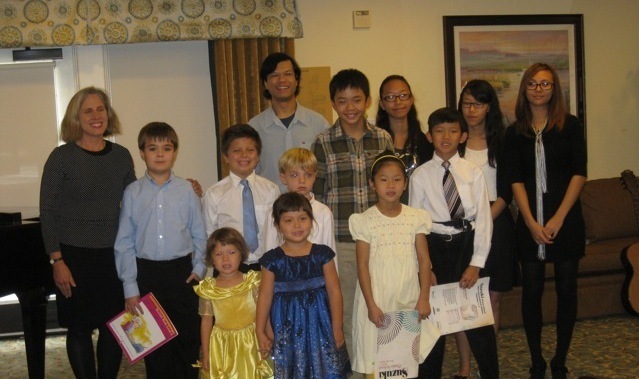 It was a great wide range of players from my little ones to 15, 16 and 17 year old – two of which played piano and one violin that was very beautiful. I looked out into the audience and this one gentleman had such a peaceful pleasant expression. Everyone enjoyed the middle level children playing Bach piano pieces as well. It was a great experience and we look forward to going again Dec. 20 there. Thank you MSSL for organizing the even, to all the participants who performed, and to Susan Carpenter and Manak Khamvongsa for their help and support.